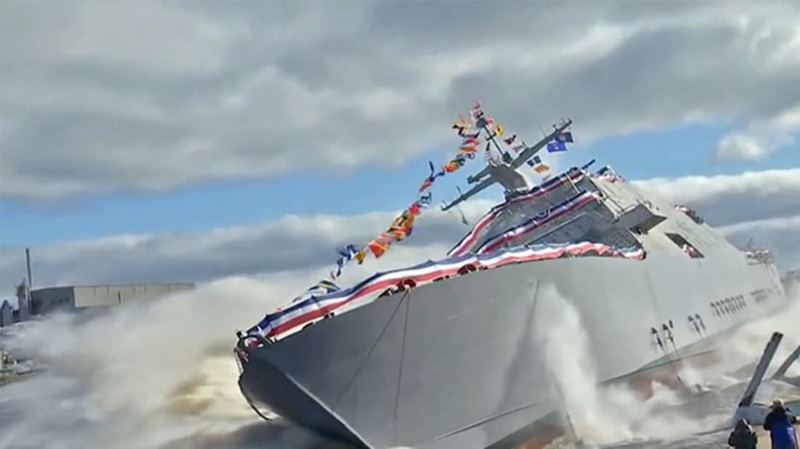 On October 18, 2014, the USS Detroit (LCS-7) was launched was launched into the Menominee River in Wisconsin. This Navy ship is over 375 feet long, and the surprising thing is the way it was put into the water—by sliding it sideways off the dock and relying on its buoyancy (plus apparently some guide cables) to keep it from capsizing. Although it's probably not news to people who dig boats, for me, this was a really surprising video! This is just 45 seconds, and it's pretty intense. According to The Kid Should See This, side launches are typical for this kind of vessel.